Crocus are my favourite Spring flower. When I was a little girl I had a book about Easter and there was a character called Trader Bunny in it. The story is lost in the mists of my memory but I remember that he “could not bear to see anyone cry” and that he had a thing for crocuses – purple ones to be exact. I think there was something about an Easter bonnet in the story as well, but as I have been unable to find the book in my parents’ things, I am afraid I may never know. Suffice it to say that I have such lovely memories of my Mom and Dad reading the story to me that ever since then I have loved crocus. I always try to have some either in the garden or in pots, or both. Actually, I have some tulips coming through in another pot by the front door as well, although it is just the tiny shoots starting at this point. 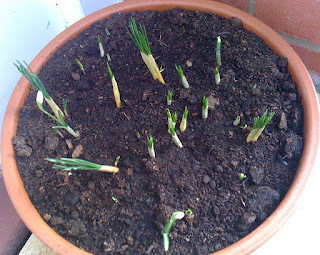 It’s wonderful seeing these lovely promises of Spring as I walk in and out of the front door. Days like today are such a treat. Although it was bitter cold, it was sunny and I love the sunshine. I used to get teased about the “April showers” rhyme and lots of people said I must like the rain because of what it said, but I never really have – except if we are all at home and I can hear it on the roof while I am lying in bed. Now that is cosy. But I am definitely a fair weather girl, that is for sure. It’s easy to get discouraged this time of year. It still gets dark pretty early, it is cold and often grey outside, but these little shoots of green promise remind us that Spring is on its way. It won’t be long now! Is there a Ten Step Program for Plan-aholics? Where did the week go (again! )?